Today I thought I would cover the elements of drawing the nose, including the planes of the nose and the anatomy of the nose. 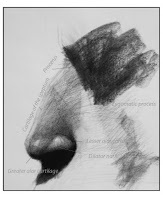 Teaching a lesson the other day I realized I had forgotten some of the anatomy of the nose. I was a little embarrassed as I explained things in more general terms and so I gave myself a refresher course. So, for todays post I had a little help from a few sources. I will list the references below for those of you who are interested. Lets look at the elements that make up the nose. First, lets look at the basic shapes and structural planes of the nose. 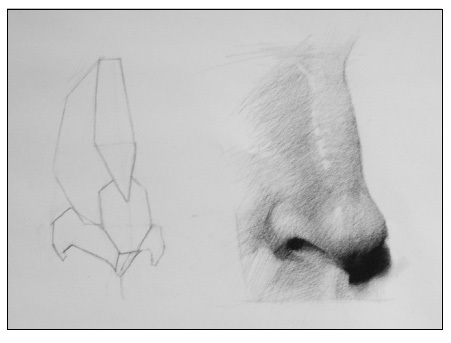 The first image below shows the basic shapes of the nose as seen from a profile view . As you can see the nose consists of three basic shapes (wings, tip, bridge). Here is a good time to note that noses come in all shapes and sizes and though the basic structure of the nose is the same, the shapes will vary from person to person. 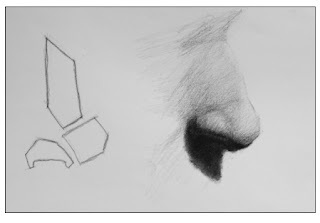 Basic shapes of the nose. Next you will see the nose represented in basic form, the planes of the nose divided into structural form. The three basic shapes are still there. 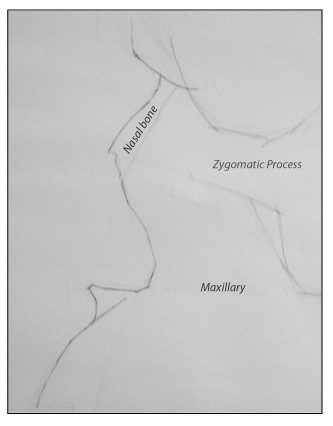 Basic structural planes of the nose. Bone structure: In this an illustration of the bone structure of a nose you will notice that most of the shape of nose is missing and in its place is a hole. That is because the nose is made up of relatively few bones. It consists of the nasal bone and part of the maxillary, called the frontal process of the maxillary. Cartilage: Here is where the familiar shape of the nose begins to appear as much of the structure of the nose is built from cartilage. 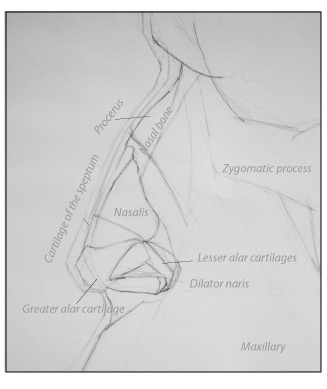 The cartilages shaping the nose are the cartilage of the septum, greater alar cartilage, and the lesser alar cartilage. The cartilage of the septum connects the the nasal bone to form the bridge of the nose. 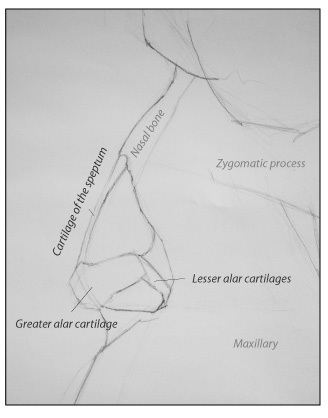 The greater and lesser alar cartilages form the tip and wings of the nose. Muscles: The major muscles of the nose consists of the nasalis, procerus, and dilator naris. 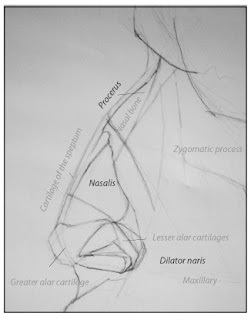 The nasalis is the band of muscle that connects to the cartilage of the septum and run along side the nose and connects on the other side at the maxilla. The procerus connects at the nasal bone and rises up into the forehead. 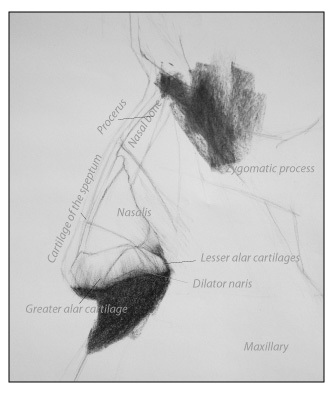 The dilator naris is situated on and around the greater and lesser alar cartilages. Skin: Here I added the representation of the the thickness of the layer of skin over the nose. For Fun: I started to shade in the values and creating the appearance of a three dimensional nose. Final Drawing: Here is the finished drawing with anatomical labels left in the drawing to show how the underlying elements create the forms and shape of the nose. Remember noses come in a variety of shapes and sizes, but the underlying elements remain the same. Practice drawing noses by drawing the noses of your friends, then try making up some of your own.